The Security Service, also known as MI5 (Military Intelligence, Section 5), is the United Kingdom's domestic counter-intelligence and security agency and is part of its intelligence machinery alongside the Secret Intelligence Service (MI6), Government Communications Headquarters (GCHQ) and Defence Intelligence (DI). MI5 is directed by the Joint Intelligence Committee (JIC), and the service is bound by the Security Service Act 1989. The service is directed to protect British parliamentary democracy and economic interests, and counter terrorism and espionage within the UK. The service has had a national headquarters at Thames House on Millbank in London since 1995, drawing together personnel from a number of locations into a single HQ facility: Thames House also houses the Joint Terrorism Analysis Centre, a subordinate organisation to the Security Service; prior to March 2013, Thames House additionally housed the Northern Ireland Office (NIO). The service has offices across the United Kingdom including an HQ in Northern Ireland. Details of the northern operations centre in Greater Manchester were revealed by the firm who built it. The Security Service comes under the authority of the Home Secretary within the Cabinet. The service is headed by a Director General at the grade of a Permanent Secretary of the British Civil Service who is directly supported by an internal security organisation, secretariat, legal advisory branch and information services branch. The Deputy Director General is responsible for the operational activity of the service, being responsible for four branches; international counter-terrorism, National Security Advice Centre (counter proliferation and counter espionage), Irish and domestic counter-terrorism and technical and surveillance operations. The service is directed by the Joint Intelligence Committee for intelligence operational priorities. It liaises with SIS, GCHQ, DIS, and a number of other bodies within the British government and industrial base. It is overseen by the Intelligence and Security Committee of Members of Parliament, who are directly appointed by the Prime Minister, by the Interception of Communications Commissioner, and by the Intelligence Services Commissioner. Judicial oversight of the service's conduct is exercised by the Investigatory Powers Tribunal. All employees of the service are bound by the Official Secrets Act. In certain circumstances employees can be authorised to carry out activity, which would otherwise be criminal, within the UK. The Security Service is derived from the Secret Service Bureau, founded in 1909 and concentrating originally on the activities of the Imperial German government as a joint initiative of the Admiralty and the War Office. The Bureau was split into naval and army sections which, over time, specialised in foreign target espionage and internal counter-espionage activities respectively. This specialisation was a result of the Admiralty intelligence requirements related to the maritime strength of the Imperial German Navy. This specialisation was formalised prior to 1914 and the beginning of World War I, with the two sections undergoing a number of administrative changes and the home section becoming Directorate of Military Intelligence Section 5 (MI5), the name by which it is still known in popular culture. MI5 was consistently successful throughout the rest of the 1910s and 1920s in its core counter-espionage role. Throughout World War I, Germany continued trying to infiltrate Britain but MI5 was able to identify most, if not all, of the agents dispatched. MI5 used a method that depended on strict control of entry and exit to the country and, crucially, large-scale inspection of mail. In post-war years, attention turned to attempts by the Soviet Union and the Comintern to surreptitiously support revolutionary activities within Britain. MI5's expertise, combined with the early incompetence of the Soviets, meant the bureau was successful once more in correctly identifying and closely monitoring these activities. In the meantime, MI5's role had been substantially enlarged. Due to the spy hysteria, MI5 had been formed with far more resources than it actually needed to track down German spies. As is common within governmental bureaucracies, this caused the service to expand its role, to use its spare resources. MI5 acquired many additional responsibilities during the war. Most significantly, its strict counter-espionage role blurred considerably. It became a much more political role, involving the surveillance not merely of foreign agents but also of pacifist and anti-conscription organisations, and of organised labour. This was justified through the common belief that foreign influence was at the root of these organisations. Thus, by the end of the World War I, MI5 was a fully-fledged investigating force (although it never had powers of arrest), in addition to being a counter-espionage agency. The expansion of this role continued after a brief post-war power struggle with the head of the Special Branch, Sir Basil Thomson. After World War I, Kell's department was considered unnecessary by budget-conscious politicians. In 1919, MI5's budget was slashed from £100,000 and over 800 officers to just £35,000 and 12 officers. At the same time, Sir Basil Thomson of Special Branch was appointed Director of Home Intelligence, in supreme command of all domestic counter-insurgency and counter-intelligence investigations. Consequently, as official MI5 historian Christopher Andrew has noted in his official history Defence of the Realm (2010), MI5 had no clearly defined role in the Anglo-Irish War. To further worsen the situation, several of Kell's officers defected to Thomson's new Agency, the Home Intelligence Directorate. MI5 therefore undertook no tangible intelligence operations of consequence during the Irish War of Independence. MI5 did undertake the training of British Army Case Officers from the Department of Military Intelligence (DMI) for the Army's so-called "Silent Section" otherwise known as M04(x). Quickly trained by MI5 veterans at Hounslow Barracks, outside London, these freshly minted M04(x) Army case officers were deployed to Dublin beginning in the Spring of 1919. Over time, 175 officers were trained and dispatched to Ireland. In Ireland, they came under the command of General Cecil Romer and his Deputy, Lieutenant Colonel Stephen Searle Hill-Dillon. In April 1919, Colonel Walter Wilson of DMI arrived in Dublin to take over the day-to-day management of these 175 Army intelligence officers, and the unit was designated as the "Dublin District Special Branch" (DMI/MO4(x)/DDSB) because it operated exclusively within the confines of the Army's Dublin Military District. Royal Marine Colonel Hugh Montgomery of the Department of Naval Intelligence, was also seconded to Romer's intelligence staff at this time. British Army after-action reports and contemporary accounts indicate that M04(x)/DDSB was considered a highly amateurish outfit. Serious cover constraints, coupled with alcohol abuse and social fraternization with local prostitutes would prove to be the downfall of several of these amateur sleuths. Despite these failings, it was not MI5 but one of Basil Thomson's agents, John Charles Byrnes, a double agent within the IRA, who identified Michael Collins and came close to arranging his capture. Byrnes was discovered as a British spy and executed by the IRA in March 1920. The intelligence staff of Michael Collins Irish Republican Army penetrated the unit. Using DMP detectives Ned Broy and David Nelligan, Michael Collins was able to learn the names and lodgings of the M04(x) agents, referred to by IRA operatives as "The Cairo Gang". On Bloody Sunday, Collins ordered his Counter-intelligence Unit, The Squad, to assassinate 25 M04(x) agents, several British Courts Martial Officers, at least one agent reporting to Basil Thomson, and several intelligence officers attached to the Royal Irish Constabulary Auxiliary Division, at their lodgings throughout Dublin. Although the shooting of 14 British officers had the desired effect on British morale, in many ways Bloody Sunday was a botched job. Three of Collins's men were apprehended after engaging in a shoot-out on the street, and at least two of the wounded British officers had no connection whatsoever to British Intelligence. Moreover, with MO4(x) having fielded a total of 175 agents of the DDSB, Collins's operation only temporarily slowed British momentum. Within days, the remaining 160-odd M04(x) agents were re-established in secure quarters inside solidly Loyalist hotels in Dublin, from where they continued to pursue Collins and the IRA relentlessly right up until the Truce. In December 1920 the entire DDSB was transferred from British Army Command to civil command under Deputy Police Commissioner General Ormonde Winter, and thereafter was known as "D Branch" within Dublin Castle. By January 1921, the highly experienced MI6 operative David Boyle arrived at Dublin Castle to take over the day-to-day management of D Branch. The unit's former commander, Colonel Wilson, resigned in protest for having had his command taken from him. D Branch thrived under Boyle's leadership. The net impact of Collins's strike of Bloody Sunday, November 21, 1920, was therefore quite negligible—even though the IRA had not gone up against MI5 professionals but instead only a quickly trained outfit of amateur army "D-Listers." MI5's decline in counter-espionage efficiency began in the 1930s. It was, to some extent, a victim of its own success. It was unable to break the ways of thinking it had evolved in the 1910s and 1920s. In particular, it was unable to adjust to the new methods of the Soviet intelligence services the NKVD and GRU. It continued to think in terms of agents who would attempt to gather information simply through observation or bribery, or to agitate within labour organisations and the armed services, while posing as ordinary citizens. The NKVD, meanwhile, had evolved more sophisticated methods; it began to recruit agents from within the upper classes, most notably from Cambridge University, who were seen as a long-term investment. They succeeded in gaining positions within the Government (and, in Kim Philby's case, within British intelligence itself), from where they were able to provide the NKVD with sensitive information. The most successful of these agents—Harold "Kim" Philby, Donald Maclean, Guy Burgess, Anthony Blunt and John Cairncross—went undetected until after the Second World War, and were known as the Cambridge Five. Whilst the British security forces in Northern Ireland have provided support in the countering of both republican and loyalist paramilitary groups since the early 1970s, republican sources have often accused these forces of collusion with loyalists. In 2006, an Irish government committee inquiry found that there was widespread collusion between British security forces and loyalist terrorists in the 1970s, which resulted in eighteen deaths. In 2012, a document based review by Sir Desmond de Silva QC into the 1989 murder of Belfast solicitor Patrick Finucane found that MI5 had colluded with the Ulster Defence Association (UDA). The review disclosed that MI5 assessments of UDA intelligence consistently noted that the majority came from MI5 sources with an assessment in 1985 finding 85% came from MI5. Prime Minister David Cameron accepted the findings and apologised on behalf of the British government and acknowledged significant levels of collusion with Loyalists in its state agencies. On 10 October 2007, the lead responsibility for national security intelligence in Northern Ireland returned to the Security Service from the Police Service of Northern Ireland that had been devolved in 1976 to the Royal Ulster Constabulary (RUC) during Ulsterisation. During April 2010 the Real IRA detonated a 120 lb. car bomb outside Palace Barracks in County Down which is the headquarters of MI5 in Northern Ireland and also home to the 2nd Battalion The Mercian Regiment. In 1996, legislation formalised the extension of the Security Service's statutory remit to include supporting the law enforcement agencies in their work against serious crime. Tasking was reactive, acting at the request of law enforcement bodies such as the National Criminal Intelligence Service (NCIS), for whom MI5 agents performed electronic surveillance and eavesdropping duties during Operation Trinity. This role has subsequently been passed to the Serious Organised Crime Agency (SOCA) and then the National Crime Agency (NCA). In 2001, after the September 11 attacks in the U.S., MI5 started collecting bulk telephone communications data under a little understood general power of the Telecommunications Act 1984 (instead of the Regulation of Investigatory Powers Act 2000 which would have brought independent oversight and regulation). This was kept secret until announced by the Home Secretary in 2015. MI5 was based at Leconfield House (1945–1976) and 140 Gower Street (1976–1994, since demolished) before moving to Thames House in 1994. 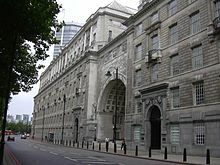 Although commonly referred to as "MI5", this was the Service's official name for only thirteen years (1916–1929), but it is still used as a sub-title on the various pages of the official Security Service website, as well as in their web address (http://www.mi5.gov.uk). ^ Intelligence and Security Committee of Parliament "Annual Report 2016–2017", page 72. House of Commons (20 December 2017). Retrieved 1 June 2018. ^ "Intelligence and Security Committee of Parliament Annual Report 2015–2016" (PDF). House of Commons. 5 July 2016. p. 10. Retrieved 12 January 2017. ^ "What's in a name?". MI5. Retrieved 14 May 2014. ^ Geraghty, Tony (2000). The Irish War. London: HarperCollins. ISBN 978-0-00638-674-2. ^ "Intelligence, Counter-terrorism and Trust". MI5 (Press release). 5 November 2007. Retrieved 8 January 2015. ^ Leppard, David (14 June 2009). "Oops! Building firm blurts out secrets of hush-hush MI5 HQ". The Sunday Times. Archived from the original on 15 June 2010. Retrieved 28 December 2011. ^ "Security Service Act 1989: The Security Service". Legislation.gov.uk. Retrieved 27 August 2017. ^ "People and organisation". MI5. Retrieved 21 November 2018. ^ "Intelligence Services Act 1994". Legislation.gov.uk. Retrieved 27 August 2017. ^ "What the Tribunal can investigate". Investigatory Powers Tribunal. Retrieved 6 July 2014. ^ "Freedom of Information Act, section 23". Office of Public Sector Information. Retrieved 3 February 2009. ^ Leach, Robert; Coxall, Bill; Robins, Lynton (17 August 2011). British Politics. Palgrave Macmillan. p. 341. ISBN 978-0-230-34422-8. Retrieved 11 July 2015. ^ a b Grierson, Jamie (2 March 2018). "MI5 agents can commit crime in UK, government reveals". The Guardian. Retrieved 3 March 2018. ^ "Appointment of the new Director General of the Security Service". Home Office. 28 March 2013. Retrieved 20 August 2013. ^ "MI5 - The authorised centenary history". MI5. Archived from the original on 30 September 2013. ^ "End for Special Branch after 122 years". The Telegraph. 9 September 2005. Retrieved 21 November 2018. ^ Reginald McKenna, Home Secretary (5 August 1914). "Aliens Restriction Bill". Parliamentary Debates (Hansard). House of Commons. col. 1985. ^ Andrew, Christopher (2009). The Defence of the Realm: The Authorised History of MI5. Allen Lane. pp. 49–52. ^ Hiley, Nicholas (2006). "Entering the Lists: MI5's great spy round-up of August 1914". Intelligence and National Security. 21 (1): 46–76. doi:10.1080/02684520600568303. ^ Andrew, Christopher (2009). The Defence of the Realm: The Authorised History of MI5. Allen Lane. pp. 873–875. ^ Hiley, Nicholas (2010). "Re-entering the Lists: MI5's Authorized History and the August 1914 Arrests". Intelligence and National Security. 25 (4): 415–452. doi:10.1080/02684527.2010.537022. ^ "How MI5 combated Communist attempts to take over the scouts". The Telegraph. 10 April 2014. Retrieved 21 November 2018. ^ "Basil Thomson". Spartacus Educational. Archived from the original on 20 May 2012. Retrieved 1 July 2012. ^ "Stephen Searle Hill-Dillon". Bloody Sunday. Retrieved 21 November 2018. ^ a b c Hittle, J. B. E. (2011). Michael Collins and the Anglo-Irish War: Britain's Failed Counterinsurgency. Washington, D.C.: Potomac Books. ISBN 978-1-59797-535-3. ^ Dwyer, T. Ryle (2005). The Squad and the Intelligence Operations of Michael Collins. Cork: Mercier Press. ISBN 978-1-85635-469-1. ^ "Croke Park: Queen in emotionally charged visit". BBC News. 18 May 2011. Retrieved 1 July 2012. ^ Kington, Tom (13 October 2009). "Recruited by MI5: the name's Mussolini. Benito Mussolini Documents reveal Italian dictator got start in politics in 1917 with help of £100 weekly wage from MI5". The Guardian. London. Retrieved 14 October 2009. ^ a b "The Cambridge Spies". BBC. Retrieved 1 July 2012. ^ a b c d Masterman, John C. (1972) . The Double-Cross System in the War of 1939 to 1945. Australian National University Press. ISBN 978-0-7081-0459-0. ^ Hoare, Oliver (2000). Camp 020: MI5 and the Nazi Spies — The Official History of MI5's Wartime Interrogation Centre. Public Record Office. ISBN 978-1-903365-08-3. ^ "Security Service Act 1989". 4 July 2000. Retrieved 1 July 2012. ^ a b Harrison, David (11 November 2007). "Cold War rivals play at spy game". The Daily Telegraph. Retrieved 1 July 2012. ^ The Earl of Caithness, Minister of State, Home Office (30 November 1987). "Security Services Ombudsman: Access". Parliamentary Debates (Hansard). House of Lords. col. 811. ^ John Patten, Minister for Home Affairs (21 December 1988). "Official Secrets Bill". Parliamentary Debates (Hansard). House of Commons. col. 538. ^ Hollingsworth, Mark; Norton-Taylor, Richard (1988). Blacklist: The Inside Story of Political Vetting. London: Hogarth Press. p. 104. ISBN 978-0-70120-811-0. ^ "MI5 kept file on former PM Wilson". BBC News. 3 October 2009. ^ Schaefer, Sarah (22 January 1999). "Parliament & Politics: Straw will not see his MI5 file". The Independent. Retrieved 1 July 2012. ^ Bamford, James (18 November 1990). "Gordievsky's People". The New York Times. Retrieved 1 July 2012. ^ Lewis, Jason; Wynne-Jones, Jonathan (18 June 2011). "MI5 labelled the Archbishop of Canterbury a subversive over anti-Thatcher campaigns". The Daily Telegraph. Retrieved 1 July 2012. ^ Clarke, Liam (14 September 2012). "Two ex-spies target MI6 in landmark legal battle over payouts". Belfast Telegraph. Retrieved 7 January 2013. ^ "7 Tied to Faction of the I.R.A. Face Terrorism Charges". The New York Times. 19 May 2012. Retrieved 20 November 2011. ^ Palmer, Alasdair (14 May 2006). "MI5 mission: impossible". The Daily Telegraph. Retrieved 1 July 2012. ^ "Barron finds British collusion in attacks". The Irish Times. 29 November 2006. ^ "Final Report on the Report of the Independent Commission of Inquiry into the Bombing of Kay's Tavern, Dundalk" (PDF). Houses of the Oireachtas. November 2006. Archived from the original (PDF) on 26 October 2008. Retrieved 20 November 2011 – via Burnsmoley.com. ^ a b "Volume 1 Chapter 11: The flow of information from members of the security forces to the UDA". Pat Finucane Review. Archived from the original on 16 December 2012. ^ "Pat Finucane murder: 'Shocking state collusion', says PM". BBC News. 12 December 2012. Retrieved 16 July 2017. ^ "MI5 In Northern Ireland". Security Service MI5. Retrieved 15 July 2017. ^ "Transfer of national security lead to the Security Service". Police Service of Northern Ireland. Archived from the original on 8 June 2008. ^ "Man arrested over Palace Barracks bomb released". BBC News. 9 May 2010. Retrieved 1 July 2012. ^ McDonald, Henry (2 March 2008). "MI5 targets Ireland's al-Qaeda cells". The Guardian. Retrieved 5 June 2014. ^ Howells, Kim (May 2009). Could 7/7 Have Been Prevented? Review of the Intelligence on the London Terrorist Attacks on 7 July 2005 (PDF). London: UK Cabinet Office, Intelligence and Security Committee. Archived from the original (PDF) on 6 June 2009. ^ a b Baroness Blatch, Minister of State, Home Office (10 June 1996). "Security Service Bill". Parliamentary Debates (Hansard). House of Commons. col. 1502–1503. ^ "About us". National Crime Agency. Retrieved 21 November 2018. ^ Corera, Gordon (5 November 2015). "How and why MI5 kept phone data spy programme secret". BBC News. Retrieved 9 November 2015. ^ Whitehead, Tom (4 November 2015). "MI5 and GCHQ secretly bulk collecting British public's phone and email records for years, Theresa May reveals". The Daily Telegraph. Retrieved 9 November 2015. ^ "Here's the little-known legal loophole that permitted mass surveillance in the UK". The Register. 9 November 2015. Retrieved 9 November 2015. ^ "MI5 has secret dossiers on one in 160 adults". The Mail on Sunday. 9 July 2006. ^ Jack Straw, Home Secretary (25 February 1998). "Security Service Files". Parliamentary Debates (Hansard). House of Commons. col. 346–348. ^ "MI5 Files". Parliamentary Debates (Hansard). House of Commons. 5 June 2006. col. 278W. ^ "MI5 (The Security Service)". The Secret Architecture of London. Retrieved 18 February 2017. ^ Sheldon, Robert (June 1993). Thames House and Vauxhall Cross (PDF). London: National Audit Office. p. 43. ISBN 978-0-10556-669-4. Retrieved 7 July 2013. Aldrich, R. J.; Cormac, R. (2016). The Black Door: Spies, Secret Intelligence and British Prime Ministers. Collins. ISBN 978-0-00-755544-4. Andrew, Christopher (2009). The Defence of the Realm: The Authorised History of MI5. Allen Lane. ISBN 978-1-84614-284-0. Published as Defend the Realm: The Authorised History of MI5, USA: Knopf, November 2009, ISBN 978-0-307-26363-6 . Curry, John (1999). The Security Service, 1908–1945. Public Record Office. ISBN 978-1-873162-79-8. Hennessey, Thomas; Thomas, Claire (2009). Spooks: The Unofficial History of MI5 from the First Atom Spy to 7/7, 1945–2009. Amberley. ISBN 978-1-84868-079-1. Hennessey, Thomas; Thomas, Claire (2010). Spooks: the Unofficial History of MI5 from Agent ZIGZAG to the D-Day Deception, 1939–45. Amberley Publishing. ISBN 978-1-4456-0184-7. Machon, A. (2005). Spies, Lies and Whistleblowers: MI5, MI6 and the Shayler Affair. The Book Guild. ISBN 978-1-85776-952-4. Milne, Seumas (2014). The Enemy Within: The Secret War Against the Miners. Verso Books. ISBN 978-1-78168-342-2. Murphy, Christopher J. (2006). Security and Special Operations: SOE and MI5 during the Second World War. New York: Palgrave Macmillan. ISBN 978-0-230-00241-8. Pincher, Chapman (2011). Treachery Betrayals, Blunders and Cover Ups: Six Decades of Espionage. Mainstream Publishing. ISBN 978-1-78057-540-7. Rimington, Stella (2001). Open Secret: The Autobiography of the Former Director-General of MI5. Hutchinson. ISBN 978-0-09943-672-0. Thomas, Martin (2008). Empires of Intelligence: Security Services and Colonial Disorder after 1914. University of California Press. ISBN 978-0-52025-117-5. Thurlow, R. (1994). The Secret State: British Internal Security in the Twentieth Century. Blackwell. ISBN 978-0-631-16066-3. West, Nigel (1981). A British Security Service Operations, 1939–1945. Bodley Head. ISBN 978-0-370-30324-6. West, Nigel (2012). Mask: MI5's Penetration of the Communist Party of Great Britain. Routledge. ISBN 978-0-415-35145-4. West, Nigel (1982). A Matter of Trust: MI5, 1945–72. Weidenfeld & Nicolson. ISBN 978-0-340-33781-3. "Records of the Security Service". The National Archives. "UK Intelligence Community On Line". Cabinet Office.